If you had a working internet connection and the capacity to Google before yesterday, you'd already seen the iPhone 6 and 6 Plus in full detail. The details of the Apple Watch, though, remained a mystery until the end. How'd Apple keep the secret? By sacrificing a small part of its magic. And by putting itself at risk. A few years ago, we wrote about a key ingredient to the success of Apple events like yesterday's: Its ability to "show and sell." Instead of trotting out doomed vaporware, or products that did materialize but far later than promised, or long after the shine had worn off, there used to be an implicit guarantee that what you saw on Apple's stage would be in its stores almost immediately. The gap between I want that and I have that was practically nonexistent. And they've pulled it off plenty of times! The iPad was a revelation. The iPhone 4S looked just like the iPhone 4, but even that caught us off guard. Leaks were either nonexistent or wrong, both because Apple policed them aggressively and because the supply chain had fewer workers with fewer smartphone cameras to spoil all the fun. You can't do that anymore, though. You haven't been able to for years. Too many parts strut out of the factory, and too many people Voltron those parts together into a near-perfect facsimile of the actual, inevitable product. Once a device has gone into production, there's simply no defense stringent enough to keep it under wraps. So what do you do? You stop showing and selling. You show, and you wait. The reason the Apple Watch was such a surprise—not its existence, but any details about how it looks or what it does—is that the Apple Watch does not, in any manner that matters to you, exist. You can't buy it, you can't use it. You can—if you attend an event dedicated to its debut—put it on your wrist, but not a version that has a workable display. 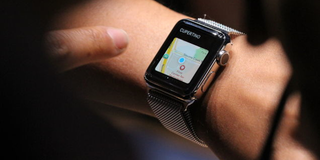 As far as you're concerned, the Apple Watch is a fairy tale. And it will remain so until some unspecified date next year. That's smart! Apple managed to pull off a "one more thing" moment for the first time in years, and debuted an input method—that "digital crown"—that no one had even guessed at. It was a classic Apple moment, in the sense that it captured an energy unique to the company, an energy we haven't seen it in quite some time. Well, that's not entirely true. Yesterday's Apple Watch Moment had a trial run with last year's Mac Pro, a cylindrical outlier whose very existence was a surprise. That Apple was refreshing the Mac Pro at all should have warranted more leakage; that it looked like a space-aged trash can all the more so. The Mac Pro didn't leak, though, because the Mac Pro wasn't ready when it was announced. It wouldn't be for four more months. So that's the new game plan, it seems. If a product is important enough, different enough, secret enough to merit a surprise debut, just show a prototype. Worry about the supply chain later. After all, it worked flawlessly with the Mac Pro. But the Apple Watch will be a much tougher test. After announcing the Mac Pro, Apple had to live up to a single promise: That it would be able to mass-produce a desktop computer that fit all of its parts into sleek round package. But after announcing the Apple Watch, Cupertino has to live up to the promise of a generation-defining product. Just think of everything Apple needs to get right between now and whenever the Apple Watch comes out: A brand new physical smartwatch interface. A brand new smartwatch operating system, packed with features that no one has ever attempted before. The ability to work seamlessly and securely with partners who control everything from your hotel room lock to your checking account. Three kinds of smartwatches, each in two sizes. Tactic feedback. Heartbeat-sharing. Animated homescreens. Fitness tracking. Battery life. Battery life. Battery life. That's not to say that none of these things already work in some capacity; there were demos aplenty. It's also not to say that I doubt Apple can pull it off. The Apple Watch vision is clear, and clearly achievable. It's also clearly not finished; if it were, you'd be ordering it alongside the iPhone on Friday. That's a strange position for Apple to find itself in. Clearly it thinks there's still enough power in The Reveal to be worth it. But sometimes the hardest trick of all is making sure your promises come true.